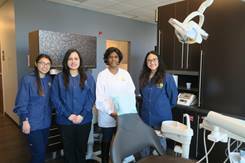 WEST GROVE — La Comunidad Hispana (LCH) has been providing high-quality dental care for southern Chester County residents since 2017. Its three-chair facility on McFarlan Road in Kennett Square became booked to capacity soon after opening, as the need for dental care is so high. LCH served more than 900 patients in 2017, and more than 1,300 in 2018. LCH’s Dental Team at their new site in West Grove.